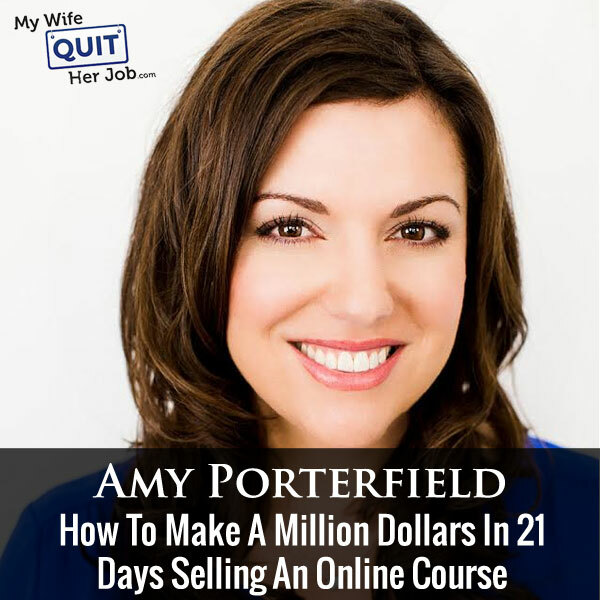 Amy Porterfield is one of the most successful mediapreneurs that I know. She started out by working for Harley Davidson as a cool biker girl. Then she worked for Tony Robbins as his director of content marketing. And then she branched out on her own and has built a 7 figure empire selling products and training focused on Facebook marketing. She’s the proud author of Facebook all in one for dummies. And to top it all off, she also has a top 10 business podcast on iTunes. Now if you enjoy this podcast please leave me a review on iTunes, and if you want to learn how to start your own online business be sure to sign up for my free six-day mini course, where I show you how my wife and I managed to make over 100k in profit in our first year of business. Go to www.mywifequitherjob.com sign up right on the front page, and I’ll send you the free mini course right away via email. Now before I begin I want to give a quick shout out to my sponsor Bigcommerce. Now Bigcommerce is a fully hosted shopping cart platform that allows you to set up your own online store in minutes. And as most of you probably know, I teach a class on how to start a profitable online store, and Bigcommerce is actually one of the shopping carts that I highly recommend in my class. Now here’s what I like about Bigcommerce. Unlike other competing platforms, Bigcommerce does not nickel and dime you with every little shopping cart feature. And when you sign up, you immediately have a fully featured and extremely powerful shopping cart at your disposal. There’s also an incredible theme store where you can choose from a variety of attractive store designs, so you don’t really need to hire a designer. Everything from design to payment processing is all built-in, and all you got to do is populate it with your own products. So you can literally start your own online store in a matter of hours. Simply go to bigcommerce.com/mywifequitherjob, sign up and you will instantly receive one month free. Once again the URL is bigcommerce.com/mywifequitherjob. I also want to thank HostGator for sponsoring the show. HostGator is an incredible webhost that I highly recommend. And in fact did you know that mywifequitherjob.com was hosted on HostGator in the very beginning? They offer 24/7 live support via chart, phone and email, one click WordPress install and easy-to-use-website builder, design services, marketing services and the best part is that I’m offering a 30% discount for all podcast listeners. So please go to HostGator.com/mywifequit to redeem the discount. Once again that’s HostGator.com/mywifequit. Now on to the show. Steve: Welcome to the My Wife Quit Her Job Podcast. Today I’m thrilled to have Amy Porterfield on the show. Now Amy is one of the most successful mediapreneurs that I know. And she started up by working Harley Davidson as a cool biker girl. Then she worked for the D. Tony Robbins as a director of content marketing. And then she branched out on her own and has build a seven figure empire selling products and training focused along the Facebook marketing platform. Now she’s the proud author of Facebook “All in One for Dummies,” and to top it all off, she also has a top ten business podcast on iTunes. Now here’s the thing about Amy and her podcast, first of all, when my wife found out that I was having her on the podcast, she went nuts. And second of all, I don’t normally listen to podcasts, but Amy’s podcast is actually one that I check out from time to time especially when I’m stressed out. And why is that, she’s got this soothing voice that tends to calm me down. So bad day at work, bad day at sales of an ecommerce store, I hit up Amy for some stress relief. And with that, welcome to the show Amy. How are you doing? Amy: Well thank you so much for having me. That just makes my day. Steve: I hope that didn’t come across as creepy. Amy: It’s so sweet. I love it. Steve: So you know what’s hilarious is that when I was emailing with your assistants to get you on the show, they stressed multiple times that this interview was going to be audio only, so it kind of gave me this impression that you like to do these interviews in your pajamas and underwear, or something like that. Amy: I have had so many instances where I didn’t know it was video and I’m literally like not ready for camera, meaning I don’t do a lot to get ready when I’m working from home, and maybe I’m just vain and that’s maybe the girl in me. But come on, I got to do my hair, makeup and stuff. So I like to be prepared. Steve: Yeah I mean just for good measure, I mean my pajamas right now too. So it’s all good. Amy: Okay, right. So you get it. Steve: So Amy gives us a quick background story, tell us about your background and how you went from working for Tony Robbins to being an online entrepreneur. Amy: Well it was a really cool situation where when I was with Tony, I was—what is that? Steve: I have no idea. You are playing music? Amy: Oh no, have I? I don’t know what that is. I thought it was you. Okay I am so sorry. That was something on my phone. I don’t know why it kind of went off. I’m not even touching it. I’m sorry; do you want to repeat the question? Steve: Yeah just start over from what you were going to respond. Amy: Hear me out. Okay, no brainer. So it was kind of a really cool situation. And what happened was I was the director of content development over at Tony Robbins. And at the time, he was getting into more online marketing, and wanted to do some online marketing launches with his programs. And so we ended up bringing in a bunch of online marketers that were doing amazing things in the space, and a lot of them lived Brooklyn San Diego which was where the headquarters was, but others flew in for the little meeting we had. And a bunch of these guys sat around the table, Frank Kern, Eben Pagan, Jeff Walker, Brendon Burchard, some names you might know, they are just these big guys in the internet marketing world. I was in corporate since I was really young right out of college. So having a business of my own was never even on my radar. And so when these guys were going around and talking, and I just started listening a little bit more, and I instantly got that entrepreneurial bug. I wanted to be a part of it. So for the next year I asked him to move me to the marketing department and work on the launches that these guys were teaching us. So I literally was in the trenches working on online launches, loved every minute of it like couldn’t get enough of it. And so about a year from then, I also started dabbling with social media, helped Tony with his Facebook page, he took off on Twitter, it was amazing. Tony fell in love with social media. So I thought, “Okay, that’s what I can do.” So taking a lot of baby steps, I ended up going out on my own and doing consulting for social media. My business looks a whole lot different today than it did five years ago, but that’s basically how I got my start. Steve: I’m pretty big Tony Robbins fan. So if you can give me a quick example of kind of what you did for him before you left, and what you learned from it, that would be great. Amy: So when I was there, I was in the content development department which meant anything that Tony would think of or create, it would go through our department. And we had a lot of writers, a lot of designers, creators, and we would turn it into his audio programs or live event content or work books, books, anything like that. So all the content went through our department. Now Tony is a genius in the sense that he always has ideas. He’s very much involved in the content creation, and so there are many, many meetings up to like two or three in the morning working with just, I call it riffing [ph], but he was riffing on all these ideas. We would take tons and tons of notes, and we take all of that together and try to put it into something that made more sense for the audience. And so were really into that content. So I got to travel the world with him, and worked on the content that he would do on stage so e.g. in the Philippines, in Australia. It was a pretty amazing experience. Steve: Yeah that’s amazing. Did you actually start your own stuff while you were working for Tony, or like was there any overlap? Amy: Great question. There was overlap. So what I did is I started waking up at 5:00 am every morning, and from about five to seven I would just start learning everything I could learn about internet marketing and starting my own business. So I did that for a good three months. And then I asked to go part time. So I had just gotten married at the time, and I was travelling way too much anyway, so it was a really good segway. And I asked, “Can I work part time on this specific project I was doing.” With some reluctance they said yes, and then I continued to work on my own business, got my first client on the side and built that up a little bit. And then finally I had to take baby steps and big decisions. So I finally got the nerve to then jump off and go out on my own. It was hard not to look back because it’s funny, when you go out on your own after being in corporate for so long, I feel like all these crazy opportunities come your way, like “Do you want to work for our business, or come work for us, or be our VP or whatever.” And I had to say no to all of it, because it would have totally derailed me which is really hard. But I took that leap and I didn’t look back. Steve: You know what’s funny Amy is I’m kind of in a similar situation. So I’ve got three online businesses that each make six figures. And I have this job which I recently just went down to four days, and I’m still playing that game. The difference is I’m in the tech sector with my fulltime job. So it’s a little harder to leave, because I don’t want to give that part of my life up. Amy: That’s really tough. And the fact though that you’ve built three businesses, six figure businesses, while having a full time job, that’s insane. Like that is—I hope you talk about that a lot, because that’s crazy. Steve: I hope like we can — I’m curious to compare some notes once we get to that point, but one thing I’m always curious about actually was did you leverage any of the audience of Tony Robins, or was your audience completely on your own, nothing related to it at all? Amy: So I had to completely break off ties in a sense that I couldn’t really leverage that audience, I didn’t really have access to it. However, I definitely took advantage of adding the Tony Robins in my bio. I always talk about him because he is a huge part of my life, and so that is always part of my story which I know helps, I definitely know it helps always. Amy: Yeah, which I don’t necessarily suggest to everybody. So I did end up quitting. I kind of got to that point that is like bubbling up inside me that I just had to either do it or not do it at all. It just got to that emotional point for me, and I was probably scared I would never do it if didn’t just finally take a leap. So I had a few clients and we had a little bit of savings, but truly nothing that was going to sustain us. So when I went out on my own, I was a hustler, I had to definitely make money. Luckily my husband was making money as well, but not enough that that was just going to completely support the lifestyle we had created. So yeah, that was the most stressful year in my life. Steve: Okay, and so but you did have some consulting gigs, and then you knew you didn’t want scale that because it’s not — in here it’s not scalable right? Steve: So one thing I admire about you Amy is that you are awesome at building a large and loyal audience of followers. And so by the time you started selling online training you probably had a large audience, right? Amy: By the time I got really serious about it yes. So there were some attempts in the beginning with not a large audience and they were huge failures. Steve: So let’s talk about back in early days when you had nothing. So how did you get traffic early on, and how did you build up your name? Amy: So webinars were my tool of choice, I had done some webinars while at Tony Robins kind of behind the scenes, and I knew that I felt comfortable on these webinars, so I ran with that. So I learned early on that if I could create a really good webinar and get really good at the presentation, I was going to be able to sell on that webinar. And so I just studied everything I could about webinars, and I started using Facebook ads early on as well. So I would fill up my webinars with Facebook ads and Lead Pages a company that I love, they say this all the time that webinars are great to sell, but really where they are powerful is growing your email list. And I think that’s how my list grew so quickly. Steve: So you would go on these webinars without having a product to sell just for the purposes of building up an email list? Amy: No I wish I had that smart; I didn’t start webinars till I actually had something to sell. Now in early days, I didn’t sell that much, but I did get kind of the experience I was transitioning into a seller on a webinar, I had like a $97 program. Steve: Okay, and so before you — actually in the early days before you had anything, did you kind of build up an audience part of the Facebook ads? Amy: Oh, gotcha, okay, so not really and here is why. I had a mentor that would tell me every time we met Amy focus on growing your email list; focus on growing your email list. In that first year and a half I did not focus on growing my email list probably because it scared me, I didn’t know exactly what I needed to do to make that happen. It seemed very confusing to me and overwhelming, so instead I focused on growing my website. Meaning like writing my blogs every day, and working on my logo and my business card and all of the things I shouldn’t have really been focusing on. Now at the same time I had clients I was consulting, so I had to care of all of those clients which pretty much derailed me from focusing on the things I should have been focusing on. And so for a year and a half I did not, so I had about 600 people on my list after a year in the business. And then when I tried to launch my first online training program it was a huge failure, just because I didn’t really have anybody that was listening yet. So that’s when I felt the sting and I thought all right, I get it, now I know what I need to do. Steve: So what was your first product? Amy: My first product — I’m embarrassed to say this, my first product was how to — I think it was something like how to launch your book online now. I had never launched a book online in my life, however, I had worked with a lot of authors whether it would be Tony Robins or at the time I had worked with the [inaudible] [00:14:20] group, not him individually but his group. So I had worked with a lot of authors, so I though this is perfect, I know social media, I work with authors, I’m going to do have—launch a book online. I should have never done that, I didn’t know enough and I just didn’t know what I didn’t know. So I thought I was going out with something great, but looking back it’s kind of embarrassing. Steve: So was that launch from your list, or did you use Facebook ads for that? Amy: So that actually was from my list, so I had maybe 20 people on my first — actually I didn’t even start with the webinar, I started with a tele-summit kind of thing. And I had probably 20 people on that first one I remember, and no sales came through. And then I graduated to webinars. Steve: Okay, well, let’s talk about your first successful product, how’s that? Amy: That would be much better, you are trying to get to cry, are you Oprah or something, what’s going on? Amy: What happened was this is actually a good story and a good lesson for those just kind of started now, or trying to get out there and do something. I had started to go to a lot of networking events, good and bad. It took away from me creating my first real successful online training program, but I wanted to get my name out there, and I was working with Mike Stelzner a social media examiner. He had just started his website and he invited me to a few events one being BlogWorld, or at least it was called BlogWorld at the time and [inaudible 00:15:42]. And I would help him carrel people to an interview, he was interviewing a bunch of people for his own show. So I was again like taking a back seat which is what I did at Tony Robins as well, it’s really easy for me to play that role, because I had done it so long. So I did this with my Mike, he was amazingly wonderful to me and a great mentor, but still I was behind the scenes which I had to be really careful with. So I did that for about two years while I was building up my business, and I met a lot of amazing people. So the good thing about it is that these awesome-awesome people in social media, and online marketing were at these events and one that you find out was Lewis Howes. Lewis Howes and his partner Sean Malarkey, and we became friends — and yeah, so we became friends, and at the next event that we saw those guys again, they had seen some of my webinars and asked me if I wanted to partner with them on a Facebook product. I would create the product, it would be on my content and they had the machine to market it, I still didn’t really have a list. And so I created this product, super scared to do it, I had never really created a big product like this before. They helped me out a little bit, and we did tons and tons of webinars for it. And it became a huge hit, and it literally is what I felt propelled my business into the Facebook marketing. I got the book deal after that, and I started to create more online training programs. But I definitely got lucky in the sense that someone asked me to partner, now if I hadn’t done the work beforehand, if I didn’t go to the events, if I didn’t constantly blog and put myself out there and create the content, they would have never found me. So I don’t feel like it’s luck, but I think it’s good that I hustled a little bit in those early years. Steve: So let’s back up a little bit; was Stelzner huge back then when you were working with him? Steve: Molly Smith, Jesus okay, go on. Amy: I know, I got really lucky working with Tony, because there was these cool people I got access to. So Molly and I had lunch or coffee to be exact, and we asked her to look over the Facebook page we had just created for Tony. So she had lunch with us and looked over the Facebook page. And then she said, “You should really talk to Mike Stelzner, he’s created creative white papers if you need one for Tony, and we happened to need one. So Mike and I started working together while I was still with Tony, and he wrote this incredible white paper, and I was the middle man between Tony’s edits and Mike’s work that he did. Mike and I became great friends and one day he is like, hey I have got this idea that I’m doing, it’s called social media examiner. And I remember he showed me the art work and I’m like that’s a little weird, it’s kind of [continuation], and I didn’t know this guy that much, but I really liked him. So he said “Hey, if you do go out on your own, let me know, I could hire you for starts.” So he was literally the first guy that hired me for anything. And it turns out he became this huge success with that, I mean the website is amazing, and what he’s gone on to create is pretty cool. So he wasn’t ads big of a deal then. Steve: And Lewis Howes and Sean Malarkey, same thing? Amy: Lewis kind of was a big deal, I think he was born a big deal, so he knew everybody; he was already doing his LinkedIn programs, so he was definitely a big shot. I didn’t know enough about Sean Malarkey to know what he was up to just yet. Steve: So why did they choose you, like how did you stand out early on like — because you didn’t have an audience, what was their incentive yeah? Amy: Yeah, so that’s such a great question. So here is a good lesson in that, Lewis had asked me to do a free training for them, like record a video about Facebook for a whole different program they were doing. And because I liked the guys, and I wanted to get my name out there I said yes, and so I recorded something for them. And Sean was watching it, and he just loved my style, and the lesson here is do what you know how to do best. I knew that I was going to do this webinar while I had this training in my blood, I loved to do it. So I knew I would come across one, and so I said yes to it. So Sean saw it, he is like this girl knows how to teach, like this is really good, come watch this Lewis. And then Lewis watched it, and so when the opportunity came up that, hey we want to publish online for the Facebook product, I was top on mind, because I had done a good job. Now if they told me to write a book, they probably would have not really paid attention. I’m not the best writer, so I put myself forward on what I did do well, and I came across well to other people. Steve: So that implies you were doing a bunch of webinars before you met these guys, is that…? Amy: I’m trying to think, I did way more webinars with them than I had ever done, but yes I had started to do my own webinars before I met them. Steve: Okay, I hate to break this to you too, but I think it was your soothing voice that got them too. Amy: It was the voice? I’ll take it, whatever works. Steve: All right, so you got these two — did you have your book deal, like I can’t remember? Steve: Did not okay, so how did that come about? Amy: So what happened, it was literally, it was a good year for me. It came about the same time where I was blogging regularly on the social media examiner blog. So they finally had invited me, I kind of moved up the chain over there, they invited me to guest blog, post ads, I was doing it a lot. And this is another way of things, so I was at a networking event, I did way too many networking events in those early years, I don’t think I should have done that many but I did. And one that I did it was like how to get your mojo on business, or something like that, it was a silly name. And I went to Colorado, it was a great event though, it was just like ten of us girls and we were talking about building a business. I sat next to a woman named Andrea Wall, we hit it off, and we just exchanged like stories about Facebook, because she taught Facebook as well, and I was just getting into Facebook. And two years later, someone came to her and said we are looking for a co-author of Facebook marketing online for dummies, do you know anybody, and she remembered me and suggested me. They went on social media examiner, saw that I wrote a bunch of blogs on the topic, and invited me into the book, which was huge for me because it really solidified. I became a Facebook expert when that book came out. Steve: Okay, so I’m getting a lot of key takeaways here, it sounds like networking events was a huge part of your early success okay? Amy: Right and I find a tease like oh my God I went to way too many, but then when I look back, they did kind of shape some big things that happened to me in those early years. Steve: So doing these webinars with Lewis and Sean, they probably had huge lists at the time, right? Amy: They did, they had huge lists, huge affiliate partnerships, and they made me do like, it feels like 100 of them. So when you do that many, you get pretty good at it. Steve: So when you had one of these webinars, were you adding to your list members of their list? Amy: I was, so I worked up this deal with them that anybody who bought and anybody who opted in for a webinar, I also got that list. Amy: So that was huge. Steve: So that sounds like a pretty big jump start into just your own properties, right? Steve: Okay, and did you use a lot of paid advertising then, or was that something that happened later on? Amy: I’m trying to think when the paid out advertising really took a big jump. It was probably right around the time that this program FB influence came out. Sean and Lewis used a lot of ads for it, so I was featured in the ads and this is something funny with Facebook ads, especially more so back then, but it still works in similar ways now. My face was everywhere in those ads, and it’s funny how ads were, because if you are own personal brand or if they just hear your business name everywhere in ads, people automatically think you are doing amazing. So I heard this all the time, your business must be boiling up, I see you everywhere on Facebook, in my head I’m thinking yeah, because I’m paying for it. But it’s just like a perception, and then luckily our perception actually became real, but at the time it wasn’t necessarily real. So something kind of funny happens with those Facebook ads. Steve: So someone starting out today, would you recommend that they kind of try to take your path, put out good stuff, go to networking events, and try to take advantage of people who are bigger than you and partner with them. Amy: Not necessarily, so here is why. I think that if I — if someone already told me– if I could do it all over again, the one thing I’d change is, from day one I would start building an email list. I would create some great free giveaways whether it would be a webinar, PDF or cheat sheet or whatever. I have a few of them out there, and I take advantage of Facebook ads 100%, and I build my own list. And I don’t like the idea of having to have a partner like I love Sean and Lewis, they were wonderful to me, but it’s always — I just don’t want to give up any of my content and have to partner with somebody. So I would go that route first, and then if you do have these opportunities just be really careful what you say yes to and no to, because I said yes to hundred other things that never turned out to anything, which probably took away from me really focusing on my business. So I wish I was a little bit smarter with the yeses, but the yeses that I did say yes to, obviously panned out for me. Steve: Well, some of these yeses that were bad idea, were they partnerships or were they just products that you kind of developed in — okay? Amy: They were people asking me to create content for them. So not necessarily partnerships, but hey will you put a free session to my program. I said, yes, to a million of those, and then nothing ever came out of it. When you are new though, you’ve got to kind of experiment to see what’s a good idea or not, and then everything seems like a huge wonderful big idea or opportunity, so it’s hard to say no. Steve: So any tips on selecting the right opportunities? Amy: Yes, and we hear some very big tip that I have, and I do this now and I could have done it then if I was smarter at the time. And that is plan out let’s even say your next six months, I like planning out a year, but if that’s too daunting efforts, plan out your next six months. What do you want to promote, what affiliate deals do you maybe want to do, what do you want to create, all that good stuff. And have it very clear, like I literally get into my digital calendar and plan out the space for me to create, and get things done and promote, and it’s all in the digital calendar right now. So when someone comes to me now and says can you do this? If it doesn’t fit into my six months goal, it’s a no. And so I can put in the banner and say “Hey, let me kind of think about that for the future, right now it’s not going to work.” And if I ever want to come back to it I can, but it’s so much easier to say no when you know what your next six months looks like. Steve: Okay, I’m glad that coming on this podcast was a little piece of that next six months, awesome. Amy: It was a yes. Steve: All right, so I’m just trying to get the chronology correct here, when did you launch your membership site? So you did a bunch of smaller products with Lewis and Sean, right? Amy: I just did one, the FB influence yeah. Steve: Oh just one, okay and then that wasn’t a membership site there, right? Amy: It wasn’t and — so when I think of membership sites, I always think of like you pay a monthly fee to stay in it, and then if you stop paying the monthly fee you are out of it. And I haven’t really ever done it like that, but still I could see where a lot of people think my programs are membership sites for specific reasons will get into that I’m sure. But when I did FB influence I got the confidence, I had this $97 program that was doing well. So that’s when I branched out for the first time and created my most successful program which is the profit lab, and that started in 2012 which is right around the time about six months after FB influence launched. Steve: Okay and how did you know it was time? So you did that one product with a partner and then you had the confidence, so you decided to do your own thing where you had complete ownership of the product, right? Amy: Yeah, there was a big part of me, I don’t know where this comes from, but there was a big part of me that wanted my own thing, and I wanted it to be really careful that my revenue was not controlled by other people as well. And I wanted to make it really clear, they were amazing to me, it’s the mindset in my head that I had a partnership and it worried me sometimes. So that’s when I thought okay, I got into FB influence, it was doing well and then I started to listen to people, we had a private Facebook group. And I saw where they were struggling, what they wanted more of, where they wanted to dive in deeper, and that’s exactly what I created. At the time it was called the Facebook marketing profit lab. Now I just call it the profit lab, because it’s more than just Facebook, but that’s how it was created. Steve: And by this time when you launched that how big was your list at the time? Amy: Great question, I’m going to guess, this is so hard to remember, and I have to be careful because I know I have answered this question before. So I don’t want to throw a different numbers, but I think at that time it might have been around like 30,000. Steve: Okay, so in general do you have any recommendations on what your list size can be before you launch a course or? Amy: I don’t actually, but I have some recommendations related to this. So Davis [inaudible 00:28:13] a great friend of mine, I love that man. And he when we got into a mastermind together a few years back and I remember him telling me how much money he made, and how big his list was. And he was making — he was just starting, just as much as I was making when I was just starting, but his list was like half the size of mine. So I do feel like I could have definitely done a better job of connecting with my audience, it’s like when you can show your personal side, when you can be yourself, take people behind the scenes, let them in, you are going to have the stride, and I know it sounds like a cliché because we hear it all the time. But you truly will have this audience that just loves everything about you. And when that happens it doesn’t matter if you have 10,000, 20,000, 30,000, on your list. So I believe that you can have a small list and still make really good money, but you can’t have a small list and make good money if you don’t nurture them and constantly be putting up great content, connecting with them, inviting them in, it really does make a huge difference. Steve: Hi everyone, I just want to take a quick moment to thank FameBit.com for being a sponsor of the show. Now Fame Bit is the number one market place for You Tube influencer marketing. With over 15,000 you tubers looking to promote brands from beauty, tech, gaming, pets and more. Now video starts as low as $50, and it’s completely free to post a campaign and receive proposals from you tubers. Now if you’ve listened to my podcast before, one of my guests Emmanuel Eleyae used FameBit.com to make over $65,000 in four months with YouTube influencer marketing. And the best part is if you use coupon code mywifequit@famebit.com you will automatically get $10 off. So go to FameBit.com right now and get famous you tubers to promote your products, now back to the show. Steve: Absolutely, so anyway I have an online course myself which has got about 1200 members at this point. So I thought it would be kind of interesting to compare some notes. Amy: Yeah let’s do it. Steve: Kind of like how you structure your classes. So first of all, is your course structured like a library of videos, or do you kind of drip stuff out and just give them little pieces at a time. Amy: So I used to drip it out for years and then just last year I started to give it to them all at once. So I like both models. Tell me real quick, what is your membership site about? Steve: It’s called profitableonlinestore.com where it’s a training course that teaches people how to start ecommerce stores. Amy: Nice. Okay great. So that’s what I do. How about with yours? Do you drip? Steve: No I don’t drip and I was just curious because what the pros and cons work, because I have never dripped. I have like a library of videos where I have a certain number of videos that you should watch as soon as you sign up, but then the rest of it is just kind of watch what applies to you. Steve: We should probably define it real quick. Amy: So it’s like a module each week. So you are dripping the campaign, like open and a module opens up, and then you wait another week and another module opens up till everything is there. And the reason I like to do that is because I do have a live component to my event on my program where I do live Q&A sessions. And my program is put together in a way that is very specific. Like you need to start with video one and there’s 20 videos, and you shouldn’t be on video 20 till you’ve watched all the ones before it. It builds on each other. So it just makes sense to drip it. But the thing is we stopped dripping it, because people like to learn at different paces and there’s all of these different types of learners inside my program. Some are more advanced, some are more beginners, and so those that were more advanced they hated waiting and it was frustrating to them. And as soon as I stopped dripping and I actually saw my refund rate go down a little bit as well, because people were getting impatient. They are like, “This isn’t for me,” and then they’d live. Well that totally stopped. However, I have to be really careful now that I don’t drip. I send out a series of emails and call them, “My on boarding sequence.” For the first 30 days in my program, you are going to hear from me a lot, but I have to be careful. I can’t say, so by now you should be on module II video 1, because then it stresses everyone out because they are not there. So it’s more inspiration and like before and after pictures of some of my students of what they’ve done. But I think those emails have immensely helped as well. Steve: That’s funny because my return rate was higher than I wanted it to be until I started an email auto-responder sequence too, so I send out emails either everyday or every other day for that first 30 days as well. Amy: So smart. It dramatically changes your refund rate. I never believed it until this recently. Steve: So how do you keep people engaged and actually making progress? Like you obviously want them to be successful, right? So what are some tricks that you use for that? Amy: Okay, so one of the things that I have seen that really works well for me is a private Facebook group. Now because – so this is what I do and this is not for everybody, but it works for me. When you get into my program, I do have a time where the cart is open, we get everyone into the program, and then the cart is closed. So it’s not an Evergreen program. So when you start, if you join at the mastery level, there’s two levels, self-study and mastery. If you join at the mastery level, the first 90 days in that private Facebook group and only mastery are in the private Facebook group, the first 90 days I’m in there every single day Monday through Friday answering questions. Now it is completely overwhelming in the beginning, because it’s a few hundred people and they have a million questions. And then when they see other people asking questions they are like, “Oh well I got this one, and what about this one, what about that?” So I have to kind of calm myself down in the beginning knowing that it’s going to even add a little bit and it has already which is great. But the questions are so smart, and they allow me to correct their journey when they are going through like, “Don’t take that route. Go here.” Or “I would fix this or that.” Like I’m looking at their opt-in pages and their emails and everything they are doing, and I just feel like this is allowing them to hit success so must faster. So I love the private Facebook group interaction. Steve: Okay, and what was your motivation for doing this on Facebook as opposed to having your own private forum? Amy: So I actually have my own private forum for self study. So for self-study I have my own private forum and here’s – it’s just really a personal thing. I don’t love forum functionality. We look through so many forums, we’ve tried to find something that I’m comfortable with, maybe it’s just because I’ve been on Facebook for so long, and I’ve done groups for so long that it’s comfortable for me. But I like the flow of the conversation better inside a Facebook group. And one thing – this is totally a side not – but when I do, because I have so many people on that group I answer question for, I use Snagit and create quick videos of my voice while I’m looking at let’s say their opt-in page. And instead of typing out my entire answer to them, all they are doing is hearing my voice while I look at their stuff, and it’s so quick for me. And they like that personal touch. So that’s another thing. Steve: That’s a good tip. Amy: It really helps me. Steve: Yeah. Probably doesn’t hurt that you have the Dorset voice going on for you. Amy: Listen, I’m going to work that voice now, oh yeah. Steve: So one thing I do at my class I just started a show real quick is I had this point system. So if you are like post in the forums, if you attend office hours you get points that you can redeem for free stuff like a one on one consult and that sort of thing. Amy: Nice. That’s a great idea, so it keeps them more engaged? Steve: Yeah it encourages them to kind of post more often and share more stuff. Amy: That’s actually brilliant. I love it. It’s like the game on [inaudible] [00:35:42] people love. That’s great. Steve: So I’m just curious also. It sounds like you do launches and then you close it down, launch and then close it down. What was your motivation for doing it that way as opposed to an Evergreen type of sequence? Amy: So I actually have both. I have one Evergreen program. It’s like a Facebook one on one program. We run ads to it daily and it’s there’s a whole sales funnel. I love that. And then the real truth of it is we started doing these launches like I said back in 2012, and I’ve never made it Evergreen. Now I’m a little nervous to do so, because they’ve been wildly successful for my business, like we almost hit a million dollar launch this last one we did. And we really haven’t dialed in. And so my fear to be really transparent is if I turn that into an evergreen program, are we able going—are we going to be able to generate that, because there’s such a live aspect. I’m doing live webinars. There’s a countdown timer. The cart’s closing soon. All that urgency like our biggest days during my live launches are the days that the early bird price is going to go up by $100, and the final day that the cart closes, are huge days for us, so that all goes away in Evergreen. Now I will tell you. This is a mistaken magic on my part and I know it’s a mindset block. And I know like I read Russell Brunson’s book DotCom Secrets and I know if he was sitting here with me he’d be like, “You are crazy, and you should turn that into Evergreen.” And I am open to it. So if you could– I say, if you are starting your business, the more Evergreen automated business you can create, to me the happier you are going to be, because what’s scary– luckily, my launches have always been successful, but let’s say the next one isn’t so successful. I was relying on a certain amount of income, it didn’t come in, and now the launch is over. That to me is a little bit scary. So I don’t like the whole launch model, so I only do two a year because of that. Steve: So let me ask you this, for your Evergreen product, how do you create incentive scarcity? Amy: So what we do is, one we are playing with Deadline Funnel right now. And so Deadline Funnel’s tool is a little bit more techie than my taste, but I have some people on the team helping me. But everybody is on their own deadline depending on when you sign up for the webinar, your deadline starts. So you are seeing a countdown timer that no one else is, and so that’s your own deadline. The other thing is that’s not the only way we are doing it. We are just experimenting with that to see if it’s something we would like for our business. But what I’ve done in the past is we do a 50% discount in email. And so we’ll say okay, you get a 50% discount, here’s the secret code and then we email two more times and we say, okay this is it. This is your last email. Well the code they are getting is to the 50% page, but if you went to my jump start sales page, it’s actually a two hundred dollar product. So it’s the discount code that creates the scarcity. Steve: I see. I see. Actually this is stuff that David Siteman Garland does. Amy: Yeah, we’ve talked a lot about that at mastermind. So I got a lot of help from him. Steve: I use a similar tool called page exploration robot. Same thing I think. Amy: Well I like that. Okay, I’ll have to check it out. Steve: Okay, can we talk a little bit about your launches. I know in the past and I’ve kind of followed you for a little while. You have these really long launches, right. Sometimes they are like weeks and weeks. Steve: Yes 20 days. So how do you structure your launch to maximize sales? Amy: So what we do, there’s a few different things. The way our launch starts is that, we start promoting webinars. I do about five live webinars during those 20 days not including the new affiliates. I don’t do a big affiliates place, or maybe like five or six affiliates will do live webinars with me, but not [inaudible] [0:39:20] them. We do about five to our own list and we spread it out over let’s say the first week and a half, two weeks of the launch. And so what happens is we start running ads about a week in advance, maybe five days in advance of that first webinar. The day the webinar– the first webinar, is the day the cart opens. So the first webinar I do is the first day the cart opens, and that’s when we do the 20-day countdown. 20 days is arbitrary, it’s just kind of it’s what works for us. From there, we are constantly filling up these webinars to kind of we are using Facebook ads like $40,000, $50,000 worth of Facebook ads over 20 days. And we are filing up my webinars and then a lot of the money also for ads is going to retargeting. Anybody that hits the registration page from my webinar or the sales page, they are going to get retargeted with Facebook ads encouraging them to come back, either check up the sales page or sign up the webinar. Steve: Okay, before you go on can I just ask how much you pay for you to sign up for a webinar? Steve: It’s in line with what I’m getting too. Amy: Okay, cool. So that’s basically where we are at. And this last launch I will say, we were closer to the five dollar range and sometimes we couldn’t even get it under five dollars. So we actually stopped some of our ads. So you just never know with Facebook, because we targeted all of the same people again as we did back the last launch, but you just never know. So we run these ads. So that is part of the way we kind of keep this launch going is that we have these live webinars. In addition, a big play is the early bird special. So I come out with the price. It’s $497 for self-study or $1000 for VIP or mastery. And what happens is about five days before the cart closes; the price goes up to full price. So we are constantly talking about the early bird pricing in ads and in emails. So there’s a huge email play as well. And so we are constantly talking about the email, I mean the early bird special going away. And I close mastery on the day that the price goes up. Because usually—I probably should close it a little bit before, once it gets to around $200 is when I want to close it out. And so once we get close to that we say like we’ve got ten spots left and it’s really true. We really have ten spots left and once they are full we close it. And that’s creates some urgency as well. So there’s a lot of things going on. One other thing we added for this first time, this last launch we just finished that we’ve never done before are what we call timely bonuses, where I got the bonuses on my sales page. And in addition to that, we emailed twice with the special bonus people didn’t know about. So it gave us an excuse to email one of our words like my swipe file for my emails. You’ve got a packed swipe files. So we ran an ad about it, we emailed about it, and anybody who had already purchased got this bonus, and then we added it to the sales page as a new bonus. So it created some hype around that as well. Steve: That’s clever. So you bring back people and giving them something for them to come back to your sales funnel. Steve: Okay. How do you—when you run your webinars, how do you ensure that people actually attend, because I would imagine the conversion rate is much better when it’s live. Amy: Great question. This is kind of like something I’m super passionate about, because it’s a big deal. So for a while my attendance rate on webinars went down. They were on 20% maybe 25%. But it was low and it was freaking me out, because you are right. If people show up and they are live on that webinar, they are more likely to either buy live on the webinar, or they are more likely to pay attention to the my email funnel after the webinar. So it’s a really big deal that I get people on live. So what we do now is that we send a series of about four emails and these emails are encouraging you to get on live. “Hey you signed up. We are so excited about it.” And then one of my emails is like, “Let me tell you a story about those who show up live and those who don’t. And this is what I’ve seen.” So I actually just talk about it inside the emails. I might give a case study. I give on three questions to think about before they show up live. So that’s another thing I want them to do again. Show up live, show up live. And I give them a work book to get them kind of excited about what’s to come. So we do a really big push to get people on live. Steve: It sounds like you give away special treats for people who come on. Steve: Okay. And so what did that do to your attendance rate? Amy: So we at least got up to sometimes 32% which is pretty average. I know some people have more than that. But if I’m at 30% show up rate, I feel really good especially because if we’re using go to webinar, each of my webinars I can get about 3000 people to sign up and then I cut it off. So if I get 3,000 people to show up or to sign up for a webinar then I know I’m at least going to get 30 of that a 1,000. Steve: That is not—so what’s funny is for my class, I have done like the low energy method. So someone just signs up for my list and I have this 30-email sequence that just goes out over time. Steve: Because I just don’t have the time. I mean I have two kids and then a full time job actually, so I don’t have the time to do this stuff. But it’s really cool to hear, I mean it’s crazy the amount of people that you are getting on these webinars. So what is a typical conversion rate on a webinar that you feel good about when it happens? Amy: That one’s really tough for me, because I feel like we’ve seen it all over the place. Sometimes 10%, sometimes 20%, it really truly depends on where that audience came from. My list versus an affiliate, versus cold traffic, but one thing we do pay attention to is cost per registrant. And so if we can get that around $20, even higher, we are feeling really good. So that’s the number we started to pay attention to. How much money are we ultimately going to make per everybody that registers for a webinar? Steve: I see. So you mentioned earlier that $5 per Facebook regist—is that a registrant or someone who actually attends? Amy: A lead. Just for a lead. Amy: So if we are paying $5 for a lead for a lead and then we are making $30 per registrant, we are doing good. Steve: Oh yes, absolutely. I see where you are getting at now. So can you talk a little bit about– and we are running out of time, but can you talk a little bit about like how you actually structure the actual live webinar? Amy: Yes. So with the live webinar, what I do is, in the very beginning, and I’m very much similar to David Siteman Garland, where I tell people if you are here for this reason or this reason you are in the right place. So I just right away, if you are here to do XYZ I’m so glad you are here, because you are on the right place. And then from there, I often talk about objections and for me it’s usually Facebook no longer works, Facebook ads are too expensive all those things I know my audience is staying right off the cuff. So I address those right away. I get them so excited about the possibilities of what they could do that by the time I’m ready to sell, it is the most seamless thing, like hey you got two options here, you can try to figure out these seven steps on your own, who the heck has time for that. Or if you like my teaching style, and you think you’ve learned a lot today and you want to dive in deeper with me, then I want to invite you to the profit lab, and here is what we are going to do. So it’s just a really easy transition, and that’s where most people get stuck is the content in the sell. And usually you hear a pause which I have so done this in the past. And then in a little bit of a cranky voice, and then you go into selling it, you kind of lose out, so it takes some time. Steve: So do you offer any incentives at the end to encourage in the sign up right now? Amy: I do, I always do a fast action bonus which is just one special bonus that I only give away if you are live on a webinar. And so that is a really big, we actually recently did this with Lead Pages, I did a big webinar — three webinars with them the last three days, ten paged in the webinars to be exact, to my list. And we tried two different ways and one of the ways was, hey if you are on this webinar now you get this special bonus, but if you buy in the next few days we’ve got these five different things you get. But you have to buy now and we had a bigger cost per conversion, because of that, so or we had more buyers just to say, yeah. Steve: More revenue. So that implies that you prefer to give a ways as opposed to giving coupons, right? Amy: You are right, now you and I are in different worlds, so if I was in ecommerce I would probably do more discounts. Steve: Interesting, why is that? Amy: I feel like people — okay, so one of the things, do you know James Wentworth [ph]? Okay, so, James and I were talking and we were talking about what people need to actually join your email list. And I always see this; people come to your website for two reasons one, they need more information, they are looking for details to see if they ready to buy. Two, they are ready to buy, but they want to see how easy you are going to make it for them to buy. And so this is not always true across the board, but in many cases. So when I’m ready to buy a physical product let’s say I’m interested in [inaudible 00:48:54] I need a new hair dryer. So I know I need a hair dryer, I’m looking online, Amazon is offering it for this, this site is offering it for this, but it gives me free shipping, I’m 100% going with the free shipping. So I like when I’m going to buy a physical and I’m looking for that product, if you make it easy for me to buy, I’m more likely to do something. So discounts, free shipping, maybe a little extra zing in there, I don’t know what it would be, but if I buy this I also get that. I’m ready to buy now, so I want that, versus you again be told about my Facebook program, you might not think you even need it yet, so let me give you a free webinar cheat sheet to kind of ease you into it. Steve: Yes, sorry I misunderstood you. I thought we were talking about my digital product here not the physical product yeah, for physical product for sure yeah. Steve: I don’t dare disagree with you because you are clearly — you got a book and everything so. So just curios and we are running out of time once again, but how would your structure be different if you were promoting a physical product, which doesn’t have the crazy margins that a digital product would on Facebook? Amy: It’s so true, so I would still definitely make it play for growing my email list, but what I would do is I probably would do more of the weekly newsletter kind of things that I get from Crate & Barrel and [inaudible 00:50:12] and all that good stuff where I’m interested, tell me what you got, what’s going on. So I definitely would do a different email play every single week. And then I would personally do more discounts and free shipping in those opportunities. I would also would probably, now this doesn’t make sense, because I should be using more video now. But I probably would even use more video if I had a physical products that I could show people what it is, what it does, what it looks like, all that good stuff. So video would probably be a bigger play for me as well. Steve: Amy incidentally, that’s the only way I have been able to get Facebook ads profitable. Amy: Really, that’s so good to know actually. Steve: I send them to a content page and it’s very heavy on the email sign up forms. And it’s just a piece of content like that uses our products, like demonstrate uses of our products. Get them on the email list and there’s links to actual products that they can buy if they want, but then I market to them on the backend with an auto responder sequence. Steve: But when I was sending them straight to a product page, it was not well at all. Amy: Okay, that’s really good to know, so the video really does work well for you. Steve: Not video, just content, just text based content. We are in the wedding industry, so there’s lots of wedding ideas to get around. But we get them on the email list and then we market to them there. Amy: Gotcha, okay, I love it that’s great to know, that’s really great to know. Steve: So Amy I have kept you on for quite a while, thanks a lot for coming on. If anyone wants to check you out and check out your programs, listen to your dulcet voice, where can they find you? Amy: You can find me at Amyporterfied.com, and I want to tell you this is truly been a pleasure, you definitely have a skill for interviewing, you made it a lot of fun, I can’t believe we’ve been on for an hour. Steve: I know time flies? Steve: All right thanks a lot for coming on the show Amy, I really appreciate it. Amy: Thanks a lot, you take care. What an awesome episode, it still blows my mind how Amy made almost seven figures in a single launch, that is incredible. And in fact after talking to her, I decided to do a webinar of my own and managed to make over $60,000, so her strategies really work. For more information about this episode go to mywifequitherjob.com/episode84, and if you enjoyed this episode, please go to iTunes and leave me a review. It’s by far the best way to support the show, and please tell your friends because the greatest compliment that you can give me is to write a referral to someone else, either in person or to share it on the web. Now if you are interested in starting your own online business, be sure to sign up for my free six day mini course where I show you how my wife and I managed to make over 100K in profit in our first years business. Go to mywifequitherjob.com for more information, sign up on the front page and I’ll send it to you right away. Once again I also want to thank HostGator for sponsoring this episode. HostGator is one of the best webhost out there that I recommend if you want to start a blog. And in fact I hosted mywifequitherjob.com on there in the very beginning and loved it. You get 24/7 life support via chat, phone, and email. You can install WordPress in just a single click, and they have an easy to use website builder design services. And the best part is that I’m offering a 30% discount for all podcast listeners. So please go to HostGator.com/mywifequit to redeem the discount, once again that’s HostGator.com/mywifequit. I also want to thank Bigcommerce for sponsoring this episode. Bigcommerce is one of the best shopping carts that I recommend, if you want to start your own online store without having to worry about anything technical. So everything from design, to sourcing, to payment processing is all built in. So all you have to do is populate it with the products that you want to sell and you can literally start your store in a matter of hours. Simply go to bigcomerce.com/mywifequitherjob, sign up and you will instantly receive one month free. Once again URL is bigcomerce.com/mywifequitherjob, thanks for listening. Thanks for listening to the My Wife Quit Her Job Podcast, where we are giving the courage people need to start their own online business. For more information visit Steve’s blog www.mywifequitherjob.com. Hi Steve, where Can I access the transcript? I can no longer see it below the posts. Has been like this for the past few posts.